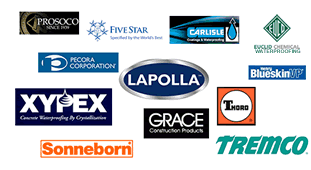 serves New England's largest commercial contractors and builders. Caulking, Waterproofing, Air & Vapor Barrier, Masonry Cleaning...we do it all. Streamline Waterproofing & Caulking provides professional installation of waterproofing materials that keep water out of buildings, parking garages and other structures. We work closely with our commercial and industrial clients to find the most cost effective product and application procedures to maintain or restore the integrity of your building. Our experience and expertise in commercial waterproofing have made us one of the most trusted waterproofing companies in all of New England. In addition to expert installation of premium waterproofing systems on new construction Streamline Waterproofing & Caulking also specializes in a wide variety of restoration and remedial waterproofing services including caulking, vapor barriers, waterproofing systems, deck sealer, traffic topping, coatings, water repellent sealer, chemical grout and epoxy injection. We are industry leaders in keeping your new or existing commercial building investment dry!